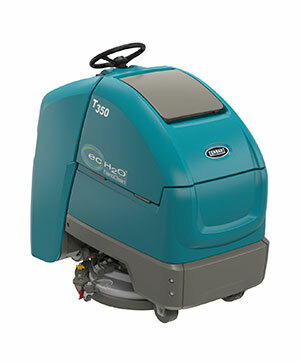 Deliver consistent scrubbing results in small, congested spaces with this easy-to-operate and maintain compact scrubber that provides peak performance year after year due to quality engineering. Pad Assist helps move the scrubber forward and decrease operator fatigue. Unique pad driver and squeegee holder make transporting or storing the T2 simple and easy. Reduce scrub deck overspray on fixtures, walls and baseboards with the self-adjusting splash skirt. 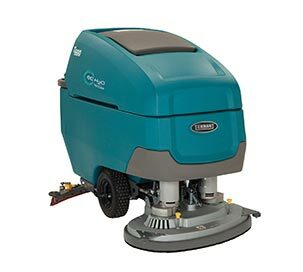 23 kg of down pressure and 230 rpm agitation provide the highest level of cleanliness. Clear sight lines increase scrubbing effectiveness by enabling operators to focus on their cleaning environment. 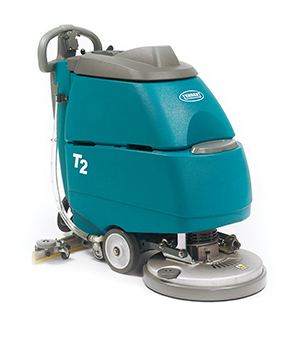 430 mm cleaning path is perfect for cleaning small, congested areas. Simplify maintenance with a squeegee system that never needs adjustment. 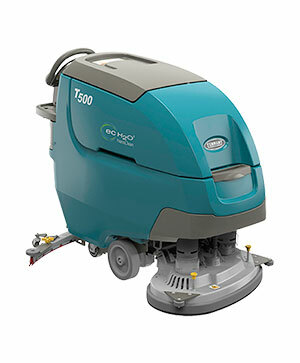 Save time and increase efficiency by completely cleaning and drying small, congested areas in one-pass. Scrub anytime, anywhere with quiet 68 dBA sound level. Optional lead acid battery provides up to 3 hours of run time. Minimise the risk of slip and fall injuries with optimal water recovery – even in 180 degree turns. Designed to provide optimal sight lines for improved safety. Optional HydroLink®* reduces risk of operator contact with battery acid. 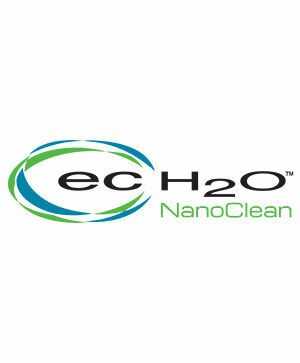 Easy-to-clean Hygenic® solution and recovery tanks reduce mould, bacteria and odours. *HydroLink® is a registered trademark of Trojan Battery Company.